Kerala State Bamboo Mission (KSBM) organized 14th edition of Kerala Bamboo Fest 2017 will be held at Kochi from December 1 to 5, 2017. The Kerala bamboo fest aim to exploring and marketing the Kerala bamboo products on international and domestic market. 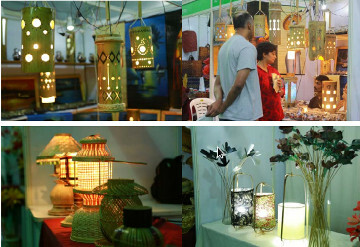 The bamboo expo showcases various bamboo products include bamboo furnitures, Handicrafts, Wood substitutes, Industrial products, Decorative and artistic products, Reed, Rattan and Screw pine etc. Kerala Bamboo Fest 2017 stalls featured with the stalls of Kerala state bamboo corporation, Kerala Forest Research Institute (KFRI),Jawaharlal Nehru Topical Botanical Garden and Research Institute (JN TBGRI), Kerala State Handicrafts Apex Co-operative Society Ltd etc. Kerala state bamboo corporation stalls includes the bamboo products like bamboo flooring tiles, bamboo furnitures. Kerala State Handicrafts Apex Co-operative Society Ltd. stalls exploring various handicraft product made out of Bamboo and natural fibers. The Bamboo Fest will have separate pavilion for bamboo food products.